Today we were happy to welcome Aid to the Church in Need to our parishes to tell us about the work of that venerable charity, and encourage the parishioners to include ACN in their almsgiving. As we have written before on our website, ACN has Norbertine origins, for it was founded by the Norbertine priest, Werenfried van Straaten, who was a Canon of Tongerloo (latterly, of Orange). You can read about his life here. 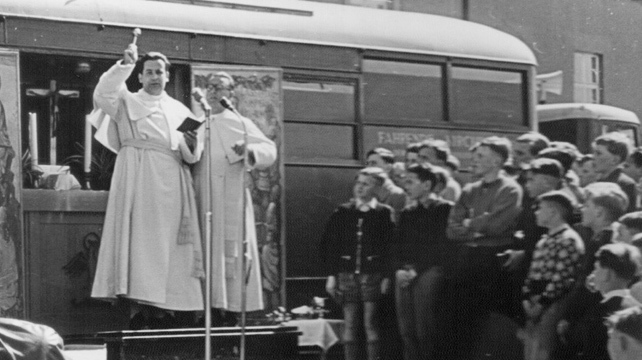 ACN was founded originally by Father Werenfried to provide relief for 15 million displaced Germans, during the ethnic cleansing (as we would say today) of Germany after the Second World War. Amongst these millions, were a great number of Catholics: Father Werenfried sought not only the material relief of these people, persecuted by tyranny, ravished by war, now forced from their ancient homelands, but also to ensure that the flame of Christ would remain burning in their hearts, a flame which the dark forces of communism sought to extinguish. Also, it would be a vehicle for reconciliation between the recently liberated Dutch-speakers and the Germans. I was touched to hear, in fact, on a recent visit to the Abbey of St Cecilia on the Isle of Wight, that the nuns remembered Father Werenfried visiting them, during a fund-raising campaign, and how, when his car broke down on his way back to the ferry, he pushed it all the way back to the boat, his collection bags in the boot. Father Werefried died in 2003. Today, ACN, whose headquarters are still in Germany, sponsors 5,000 projects in 130 countries. The charity has four goals: to defend the persecuted Church (no appropriate request should go unanswered); to strengthen the oppressed Church (when hindered by poverty, ACN helps the Church to proclaim her Faith); to refresh the Church in donor countries (the veneration of modern martyrs leads Catholics to a participate more actively in the Catholic faith); to win new benefactors. ACN is faithful to the Magisterium of the Church, and, in places where it operates, does so in conjunction with the local bishop. They encourage local projects and local initiatives, and do not try to impose themselves on existing means of solidarity; they minimise their costs as much as possible, especially by streamlining their central office, to ensure that no penny given is wasted. As we were reminded today, in two out of three countries in the world, Christians are persecuted. Two thirds of all countries. And that persecution is increasingly violent: over 100,000 Christians have been displaced from Iraq and Syria by the evil terror gangsters Islamic State; in the ancient city of Mosul (Nineveh), where Holy Mass has been celebrated every week since that city was first evangelist one-and-a-half thousand years ago, there are now no Christian families. In Nigeria, Islamic terror groups, such as Boko Haram, murder Christians with horrifying regularity, especially during Sunday Mass, and on the Church’s greatest feast-days; it seems as if the joy of every Christmas Day in recent years has been soured by the news that another Catholic Church has been attacked during Mass on that day. In South Sudan, and in many Islamic countries, Christians can be sentenced to death, if they have converted to Christ. Catholics are harangued, even in Europe, such as in Belarus and Ukraine. There are quotas on priestly ordinations in Vietnam; the Pope is prevented from appointing providing shepherds for Chinese Catholics. As this evil shadow of darkness descends upon the world in these times, we must surely ask ourselves, where will be next? America? Italy? Chelmsford? Pope Francis asked his audience lately: do you pray every day for the persecuted Church? We can ask that question of ourselves, right now, at our desks. Make a resolution to pray for our persecuted brothers and sisters every day. And hope that, when it is our turn, there is someone left to pray for us. Pray for the work, also, of Aid to the Church in Need. You can visit their website to read about their projects, and make a donation. They also have a good on-line shop, which supports their work. Please buy your Christmas cards this year from Aid to the Church in Need.